Perfect homemade vanilla bean frozen custard needs nothing but garnish, and I wouldn’t bother eating the garnish. Well ok, I would if there were a few beautifully ripe strawberries garnishing my bowl. I own a small 1 ½ quart ice-cream maker and have to chill in two batches. I'd cut the recipe in half, but this is truly slow food as it takes two days to make correctly. Although not a difficult recipe, the waiting can be madness. It’s easier to refreeze my bowl, than to wait longer for the custard to set up properly a second time. Split the vanilla bean in half and scrap the seeds and add the pods to a large sized saucepan. Add the milk, heavy cream, and pinch of salt and cook over medium low stirring frequently until you start to see bubbles form. Immediately turn off the heat and set aside for 20 minutes to let the vanilla bean steep. Meanwhile add the egg yolks and sugar to a large bowl and beat with a spoon until combined and thick. About 1 minute. Pour the vanilla mixture into the egg yolk mixture a little at a time stirring briskly to temper. Pour in the rest of the milk after a couple short pours and stir to combine. Pour the mixture back into the saucepan and heat over medium low stirring frequently until it lightly coats the back of a spoon. Don’t let the mixture come to a boil or bad things can happen to your beautiful custard! Remove from heat, stir in the vanilla extract, and divide into two storage containers equally with ½ a vanilla bean in each. Cover and store in the refrigerator overnight to chill and set up the custard. The next day, remove the vanilla bean and freeze according to the directions on your ice-cream maker. Store in a covered container in the freezer. This is about as close to perfection as you can get! Your custard sounds incredible! I will have to check the size of my ice cream maker. I think it is the same size as yours. I might be inclined to add a few strawberries but I think I will take a cue from you and eat it plain! YUMMY! I have never had good luck making home made ice cream. Yours looks perfect. Laura, vanilla ice cream is one of my most favorite things. I'd call yours a Frech vanilla which is better still. Great recipe, gorgeous, as usual, picture. Have a great day. I have a weakness for vanilla bean - YUM!!! 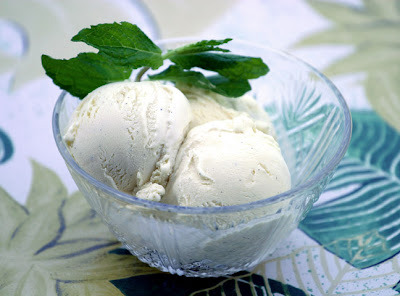 Lovely cream speckled with vanilla bean... what a simply delicate and delicious classic this ice cream is! I wish I had an ice cream maker, but have no space in my kitchen. I've made home-made ice cream once w/o the maker and it tasted good, but the texture just wasn't right. Vanilla is my favorite ice cream flavor and this custard sounds incredible. Just one more reasons I need an ice cream maker. It certainly looks like it would be worth the wait. Good Morning. I found the baby robins when I noticed a momma robin flying in and out from under my deck. Not only did I find a current next, but there were remnants from 4 or 5 past nests too. I had to squat and reach like a contortionist, clicking away without knowing if the shots were in focus or not... after 30 or more photos, I finally got a couple of decent ones. Next year I'll start watching even earlier... I'd love to get a photo of the unhatched eggs. I lost my husband a couple years ago. When it happened it was like I was dead too. No one wants to be around a widow. But, one of his friends did the best thing ever. He would come over and make me the most amazing food. It was love he gave me. That is when I became so in love with cooking great things. I have a friend who also was there for me. I told her about your food blog and she was so inspired she has started her own. It would mean so much to me if you would check it out. It would mean a lot to me if you could give her any knowledge you have! I would love to visit her blog! I'll head over there now. I am so glad you visit me here and am grateful for you. I'm sorry you lost your husband, and so sorry you were isolated as a widow. When something as horrible as that happens to us people are often scared and don't know what to do or say. The friend who came and cooked for you is a wonderful friend indeed. I'm in awe with your fabulous recipes and extra-fabulous photography skills. This sounds so delicious! I have a super tiny handcrank ice cream maker and am making two flavors tomorrow! But I'll mark this recipe for the future. It looks beautiful! OK, I've sworn off making homemade icecream since I hate it but you've convinced me to try using custard. And I'm going to have to do it without a maker so I'll probably ruin it. I hope you're happy now. ;) P.S. Are vanilla beans $5 each in Idaho??? That's how much they are here! Yikes no! They run about $2 each. Do you have a Costco near you? Often they have great ones for less too. WHAT!!! $2? I have seen them for $14 in the grocery stores here in Kansas City, two sad little dried up beans crammed into a jar. Of course you are paying for the jar. I always get mine from the city market but even then they run $5-$6. I thought I was getting a deal! But the custard does look fabulous and I have been on a homemade ice cream kick lately so I will pay the extortion and get my beans (from the city market) and give it a spin (or rather, churn). Wow. That's pretty pricy. I bet you could make this with just the vanilla extract if you don't want to spend $5 a vanilla bean every time you want to make frozen custard. We don't have no stinking Costco here. Me and Chl are in the same area and we're both probably talking about the same vanilla beans and the only ones we've found for sale at the grocery store. There are two pathetic, tiny dried up beans in a McCormick "gourmet" jar. It's $10 for the jar. But we have a local place called The Spice Merchant that I'm going to check out. I might get lucky! Check out Beanilla Trading Company www.beanilla.com for really high quality and inexpensive vanilla beans. Some are only $1!! They are also all Grade A, the highest grade of vanilla beans. (all are really moist and fresh). The Machine. The Yogurt. The Cooked Fruit.